OK…I picked up another Nubian Heritage Soap and I think this one is my favorite. The sweet but yet musky apricot scent is awesome. Also the Black Seeds are a great exfoliator because the are really tiny and scrub wonderfully. 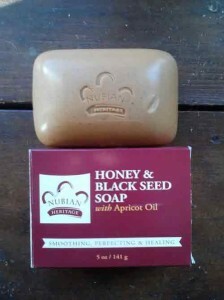 Nubian Heritage probably makes some of the best Organic soaps for the money. Rich in oils and naturally moisturizing properties that will elevate you shower experience…Guaranteed. I ripped through this soap in 7 days. Qualities: All Organic, Healing oils, Nice Moisturizer, Super Fine Black Seeds, Feel Good Soap. This Honey and Black Seed soap revives the traditional use of honey and black seed for natural skin remedies. Honey has been used in natural remedies for centuries as an anti-septic in salves, balms and warm poultices for healing wounds and burns. Vitamin rich Arabian Honey has high concentrates of proteins, essential elements and amino acids, which help the skin to regenerate and maintain moisture. Black seed, which was found in the Tomb of King Tutankhamen, has been referred to as “the seed of blessing”. In 1992, fresh out of college without jobs, Rich and Nyema embarked on a personal mission to produce high quality bath and body products utilizing all-natural ingredients and ancient healing philosophies from around the globe. Nubian Heritage is the brainchild of these lifelong friends, turned New York street vendors, who simply grew frustrated with the inferior quality, high chemical content, poor selection and exorbitant prices of skin care products. Today Nubian Heritage has hundreds of all-natural and organic products and although they are no longer made in bath tubs or kitchen sinks, little else has changed. They are still obsessed with fair trade ingredients, ancient healing philosophies, community commerce and culturally authentic products.